Translators without Borders could not exist without the generous support of our sponsors. Together, we work to raise awareness of the importance of language in humanitarian work, support those in need and create a world where knowledge knows no language barriers. Annual sponsorship commitments are available from Bronze ($1,000) to Diamond Plus ($20,000), and many levels in between. We recognize our sponsors in all of our public relations materials and outreach activities. 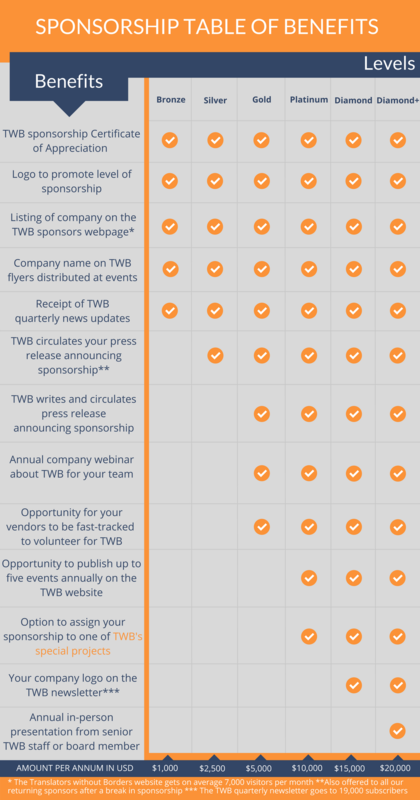 For Platinum level and above, consider sponsoring one of TWB’s impactful projects. TWB has just launched an exciting new initiative called Gamayun: The Language Equality Initiative. This new project focuses on developing language technology for twenty or so of the world’s most marginalized communities, providing a sustainable and free resource of healthcare and skills-building information to those who need it most. We are looking for partners to contribute to this this project that will run for 18-24 months. Read more. Alternatively, please contact info@translatorswithoutborders.org to explore the best sponsorship plan for you.